Google recently began tracking its user's music uploads. What's it doing with that data? A number of things, to be sure, and here's one we like very much: Google Research has created a rich, multilayered, interactive chart of musical evolution by visualizing which albums from eras-gone-by remain in our music libraries today. Google's visualization (dubbed, simply, "Music Timeline") is by no means a perfect historical account, but it does give us a pretty clear idea "which music has stood the test of time, and how genres and artists have risen and fallen in popularity." The most impressive thing (and the funnest to play around with) is the chart's granularity. Hovering your cursor over a genre pulls up a grid of album art from artists in that category of music, complete with lines that connect the artist to their position (and, in many instances, positions) along the timeline. 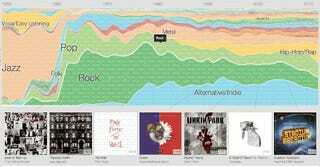 Click on any genre and the visualization morphs fluidly into a depiction of that genre's constituent sub-genres. The overall shape of each major genre shows when it hit the scene and when it retreated — for example, R&B has a long history of resurgences, but Electronica is a strictly recent phenomenon. Delve into changes in the vocabulary used to name artists and their work — funk may be over as a genre, but as a band or album name it seems to be timeless. Or search for a particular artist to see the trajectory of their career — contrast U2's long-running reinvention and re-emergence from the '80s up to today, versus a one hit wonder like Los del Río's 1995 Macarena. If you've got time (and the inclination to get lost in this sort of thing), this visualization will eat it right up. Go give it a spin!